A box outside our retail store. As most of you know, the expiration dates on many goods are flexible. You can usually eek a few more days out of milk and even more out of other goods. It all depends how far you are willing to go. Down here, the frozen dry climate lets us go much farther. Consequently, most of the food we eat is expired. The bulk of our supplies are shipped to us once a year in February via container vessel. The supplies that fill those containers arrive in Port Hueneme, CA year round. If an order gets there in March, we won't see it on ice until the following February. Then, the winter crew will unpack it for use. However, it could be used anytime up to and including the next February after that - almost a full TWO YEARS after the item was purchased. People often talk about ‘The Winter of Flank Steak’ or some other time period where they were trying to get rid of stockpiled food that was even older than two years. I've heard all types of stories that go along with our expired goods. One day, the store was stocking tortilla chips and decided what they were stocking couldn't go on the shelves. Why? It wasn't expired yet and they had a lot of other expired things that they had to get on the shelves and out the door. The box at the top of this blog is from the store. I can't even guess how old Ramen noodles have to be before they are put in that box. Just last night, they were giving out free packages of Lay's Stax. When I asked someone how old they were, they said they weren't too bad, only September 2007. Eleven months past expiration isn’t too bad? Back home, I think that would raise a few eyebrows. Down here, it’s normal. Over the summer, I heard that since we were serving up expired and cheap quality fish, a cook was tasked with seeing if they cook it and make it edible. I heard it passed. 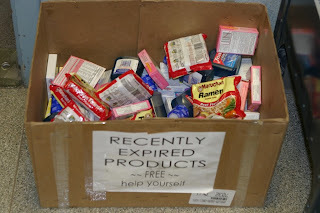 The flip side to all of these expired goods is that unless someone told me what we had was expired, I wouldn’t have known. That might be because I eat so many preservative filled meals at home or that I'm just clueless. Maybe a little of both. A view that will also soon expire. Am I going to miss the dark skies? Has a doctor actually told you you need fresh veggies and fruit??? haha. Expired Ramen is just about the craziest thing I have ever heard... I thought that stuff lasted forever. What about expired twinkies? How did your -20F night go with AC? I bet your AC couldn't even do it! I don't think twinkies expire either, but I haven't seen too many down here. I think the ones that come down are brought down. That vehicle is amazing. I'm curious how it would actually perform. I guess it depends where they used it. If it wasn't flat ground, I don't think it would do too well and there is a whole lot of Antarctica that isn't flat. 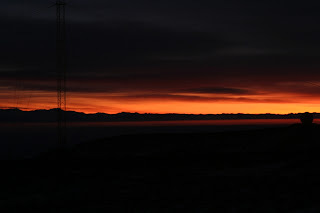 Does Scott Base have a lot more fresh food than us? They use the same transport system as us, but the ship stops there just before it comes down here. I assumed they had the same problem.